The Korea Herald is publishing a series of articles highlighting South Korea’s promising startups in the emerging sectors of digital health care and next-generation medical devices. This is the 23rd installment. -- Ed. To find out if you’re carrying extra fat -- whether you’re trying to lose weight or manage a serious health challenge like diabetes -- there isn’t much you can do other than step on a scale. Granted, there are ways to get more detailed information. You could calculate your body mass index or use what health professionals call bioelectrical impedance analysis to analyze your body composition. But body composition analyzers are bulky machines, usually found only in clinics and fitness centers, and the BMI is considered a rough measure. To fill this void, South Korean startup Olive Healthcare Platform is developing a portable scanner that uses near-infrared spectroscopy to measure abdominal fat, a key marker associated with a variety of diseases and a problem area for dieters around the world. 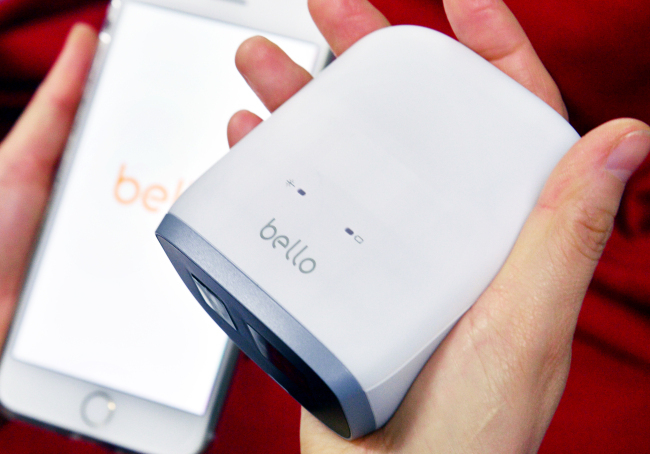 Called Bello, the startup’s belly-fat scanner shines near-infrared light onto the abdomen and calculates how much light is absorbed versus how much is scattered. Based on this information, the device measures four biomarkers -- deoxyhemoglobin, hemoglobin, lipids and moisture. These measurements are analyzed via a series of artificially intelligent algorithms to produce a measure of abdominal fat density, a more precise indicator of health status than BMI. The results are shown on a mobile app that connects to the device. 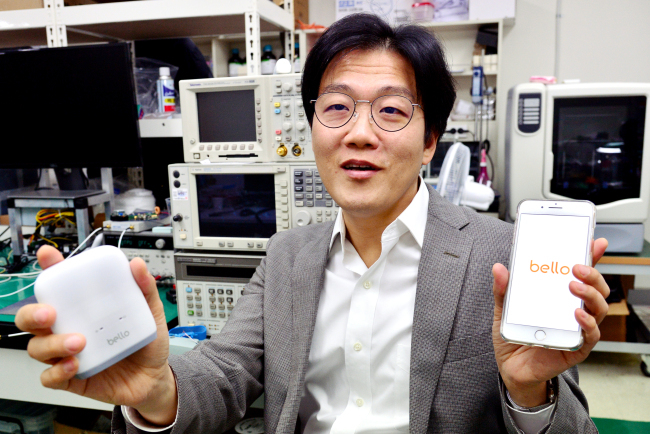 According to Olive Healthcare Platform CEO Han Sung-ho, Bello lets users conveniently track changes in their belly fat and provides segmented data that existing devices can’t. “Fat maintenance is a central element of regulating metabolic or cardiovascular diseases. But there are no other ways to closely track changes in fat density than to look at a person’s weight,” Olive Healthcare Platform CEO Han Sung-ho said in a recent interview with The Korea Herald. To use the belly-fat scanner, you place it on the skin directly above and below the navel and push a button to start the scan. Your abdominal fat density reading will appear after just three seconds. As of now, the Olive Healthcare Platform is working with Seoul National University Bundang Hospital to show similarities between the results that can be obtained from Bello and those from ultrasound machines and body-composition analyzers such as Inbody. The startup is also working to prove meaningful ties between subcutaneous fat, the kind Bello measures, and visceral fat. That’s the more problematic fat that wraps around the internal organs, Han said. Who will purchase these devices? Initially, the Olive Healthcare Platform is eyeing people with health challenges that necessitate strict body-fat monitoring, such as diabetes, hypertension and obesity. But the company is also targeting everyday dieters who want to lose belly fat and easily track their progress. In terms of commercialization, the startup initially intends to position the scanner as a wellness device. Later, it will seek medical device designation from the US Food and Drug Administration. Those efforts will begin next year, as the company plans to begin selling Bello directly to customers via Amazon in the third quarter of 2019. The device and app bundle will cost $249 and will require no additional service fees, the company said. Until then, the startup plans to stir up market interest by running a crowdfunding project in May, while also seeking strategic partnerships with insurance companies, fitness professionals and companies pursuing employee wellness programs. While Bello is its central focus, the startup is simultaneously developing a medical device that looks at the same four biomarkers to detect risk factors for breast cancer. This device monitors changes in angiogenesis -- the growth of new blood vessels, a process that supports tumor growth and may be a precursor to breast cancer. The startup expects its device to become a cheaper yet equally effective alternative to existing tools used in breast cancer diagnostics, it said. Looking ahead, Han said, the ultimate vision for the Olive Healthcare Platform is to build up a rich pool of big data that can be used to help people improve their health-maintenance routines. “The next generation of digital health care is all about providing reliable data on a health marker and to encourage people to adopt healthier habits and routines. In this respect, we hope to become a leading company (in our segment) on a global scale,” said the CEO. Bello was formed in March 2016 under Han, a Ph.D. biophysicist who worked in the health care division of LG Electronics for five years, developing visual-imaging techniques to alleviate rheumatoid arthritis. When LG Electronics announced plans to pull out of the medical diagnosis business, Han left the tech company and founded the Olive Healthcare Platform because he wanted to be part of the world’s fast-growing digital health care market. So far, the company has received 1 billion won ($884,000) in seed funding and 3.5 billion won in Series A funding from venture-capital investors, including Korea Investment Partners and Partners Investment. The startup is now seeking around 12 billion won in Series B funding with the goal of kicking off its business globally. With more business milestones ahead, its goal is to pursue an initial public offering by 2021.